Described as a “homophobic and anti-Semitic hate group” by the Anti-Defamation League, the Westboro Baptist Church is no joke. The group — infamous for using pickets with vitriolic phrases like “God hates fags” and “Thank God for dead soldiers” — regularly stages anti-gay protests across the country. Members often picket funerals for American servicemen and, sometimes, those for children. 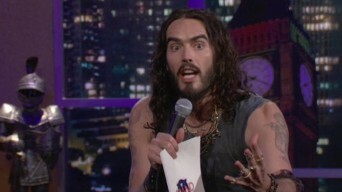 So, when British comedian Russell Brand invited two members from the Kansas-based church onto his FX show, “Brand X,” more than a few eyebrows were raised. Posted November 21st, 2012 & filed under Entertainment.